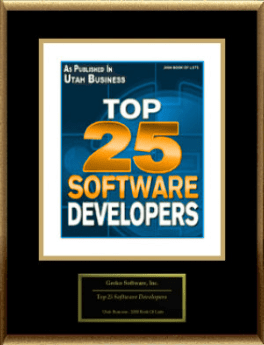 Gecko Software, Inc. of Providence, UT has been honored with a recognition by Utah Business in its selection of "Top 25 Software Developers." Providence, UT (PR NewsWire) January 17, 2013-- Announcing a special recognition appearing in the November, 2012 issue of Utah Business published by Olympus Publishers. Gecko Software, Inc. was selected for the following honor: "Top 25 Software Developers"
Lan H. Turner, owner of Gecko Software, Inc. commented on the recognition: "This is quite an honor for us. The fact that Utah Business included Gecko Software, Inc. in its selection of "Top 25 Software Developers," signals that our constant efforts towards business excellence are paying off. We are proud to be included in this recognition." Gecko Software is an internationally known trading software platform developer, with applications designed to trade Stocks, Futures, & Forex. Track ‘n Trade, their flagship trading platform has also been recognized by the industry leading Stocks & Commodities Magazine six times for their Annual Readers Choice Award. Gecko Software’s most recent addition to the financial community is their new application TradeMiner. TradeMiner has the ability to search through millions of historical financial price charts, and determine which markets have recurring price and time patterns. Many of these seasonal patterns have recurred back as many as 30 or 40 years, with a historical accuracy of upwards of 80, 90 and even 100 percent profitable. * Using this new research tool can help enhance traders abilities in finding the right stock to trade at the right time. Following the publication of Gecko Software, Inc.'s selection for Utah Business's Top 25 Software Developers list, American Registry seconded the honor and added Gecko Software, Inc. to the "Registry of Business Excellence™". An exclusive recognition plaque, shown here, has been designed to commemorate this honor. For more information on Gecko Software, Inc., located in Providence, UT. This press release was written by American Registry, LLC with contributions from Gecko Software, Inc. on behalf of Gecko Software, Inc. and was distributed by PR NewsWire, a subsidiary of UBM plc. American Registry, LLC is an independent company that serves businesses and professionals such as Gecko Software, Inc. who have been recognized for excellence. American Registry offers news releases, plaques and The Registry™, an online listing of over 2 million significant business and professional recognitions. Search The Registry™ at www.americanregistry.com. Gecko Software, Inc. Selected For "Top 25 Software Developers". Gecko Software, Inc. of Providence, UT has been honored with a recognition by Stocks & Commodities Magazine’s "Reader’s Choice Award." Providence, UT (PR NewsWire) January 17, 2013-- Announcing a special recognition appearing in Stocks & Commodities Magazine, published by Technical Analysis, Inc. Gecko Software, Inc. has been selected for the following honor: "Reader’s Choice Award"
Lan H. Turner, owner of Gecko Software, Inc. commented on the recognition: "This is quite an honor for us. The fact that the readers of Stocks & Commodities Magazine selected Gecko Software, Inc. in their selection for "Reader’s Choice Award," signals that our constant efforts towards business excellence are paying off. We are proud to be included in this recognition." Gecko Software is an internationally known trading software platform developer, with applications designed to trade Stocks, Futures & Forex. Technical Analysis, Inc. is an independent company that serves Stocks, Futures & Forex Traders with educational and insightful trading knowledge and information regarding the financial industry. Technical Analysis, Inc. also provides the industry with a once per year review and award of the top performing companies in our industry, as a reflection of their own readership choices. Gecko Software, Inc. 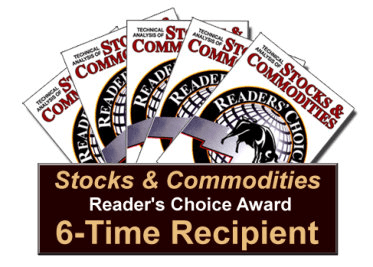 Selected For "Stocks & Commodities Reader’s Choice Award". 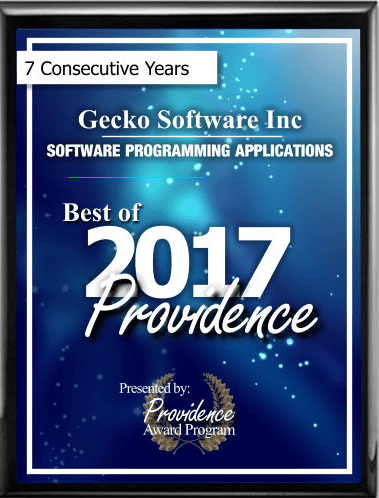 PROVIDENCE July 5, 2017 -- Gecko Software Inc has been selected for the 2017 Best of Providence Award in the Software Programming Applications category by the Providence Award Program. Each year, the Providence Award Program identifies companies that we believe have achieved exceptional marketing success in their local community and business category. These are local companies that enhance the positive image of small business through service to their customers and our community. These exceptional companies help make the Providence area a great place to live, work and play. Various sources of information were gathered and analyzed to choose the winners in each category. The 2017 Providence Award Program focuses on quality, not quantity. Winners are determined based on the information gathered both internally by the Providence Award Program and data provided by third parties. The Providence Award Program is an annual awards program honoring the achievements and accomplishments of local businesses throughout the Providence area. Recognition is given to those companies that have shown the ability to use their best practices and implemented programs to generate competitive advantages and long-term value. The Providence Award Program was established to recognize the best of local businesses in our community. Our organization works exclusively with local business owners, trade groups, professional associations and other business advertising and marketing groups. Our mission is to recognize the small business community's contributions to the U.S. economy. Copyright © Gecko Software, Inc. All Rights Reserved.